When you think hot dog history, Honolulu may not be the first city that comes to mind (hey, Chicago! ), but we’ve got one dog in particular that has stood the test of time… and no, it’s not the Puka Dog. It’s just before dusk in Nuuanu. String lights and Japanese lanterns are beginning to glow, and dancers in kimonos and yukatas circle the wooden bandstand, as the Honpa Hongwanji Hawaii Betsuin bon dance begins to heat up. But I’m not here to awkwardly two-step to the beat of taiko drums -- not yet, anyway. That’ll come later. Before I can honor my ancestors with my sweet, sweet bon dance moves, I need to wrap my hands around a KC waffle dog. 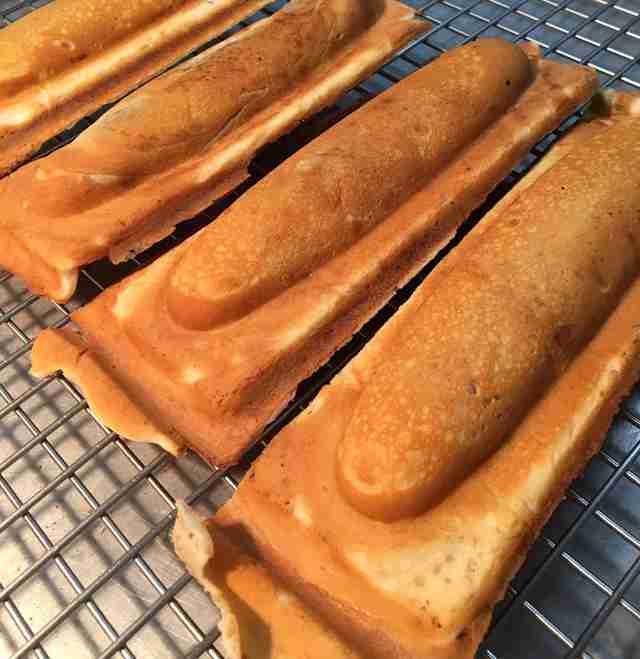 You remember them: a savory hot dog, coated in slightly sweet waffle batter and toasted to a golden crisp. The KC waffle dog is a distinctive island treat that’s been around for nearly 90 years, and was a Honolulu mainstay at KC Drive Inn, until the old-school eatery closed in 2005. 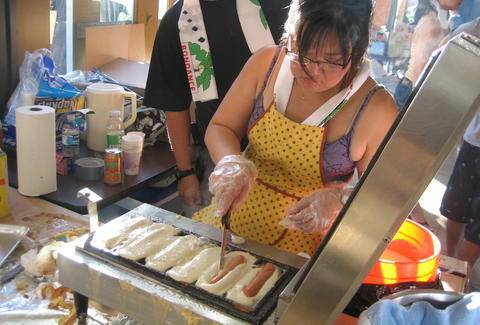 Today the waffle dog primarily lives on -- alongside other delicious local comfort foods -- during summer bon dance season. It’s not often that I’ll wax nostalgic for a piece of meat that's been pseudo-affectionately termed a "dirty water dog," but when I do, my heart's desire is for this delightful local version. The waffle dog's story begins in the late 1920s. To set the scene: Calvin Coolidge is president; Hawaii is a US territory; Hollywood’s first talking movie, The Jazz Singer, has just premiered, Charles Lindbergh is about to make his first solo flight across the Atlantic; and most importantly, Oahu’s first drive-in restaurant, KC Drive Inn, opens at the corner of Kalakaua and Ala Wai, where servers deliver waffle dogs and malts to car windows on plastic trays. In 1934, Jiro Asato purchased the diner from two men named Knapp and Christensen for $350. Asato -- who later legally changed his name to KC Jiro Asato, because customers kept calling him "KC" -- had bought, along with the building, the diner’s name, the "KC" moniker, and the restaurant's all-important set of gleaming waffle dog machines. Jiro's grandson, Dayton Asato, remembers his time working the restaurant's busiest hours in the 1970s, when the restaurant was located in Waikiki and open 23 hours a day; the eatery would catch both the post-surf and post-disco crowd. "Some customers would ask me if ‘KC’ stood for ‘kissing corner,’ because couples would make out in the back," Asato laughs. Dane Okabe also worked at KC Drive Inn while he was in high school in the late 1970s, at the Waikiki location. He didn’t work the graveyard shift, but has fond memories of serving up the waffle dog. "The first day on the job, they teach you how to make the waffle hot dog batter," says Okabe. He recalls pouring the ingredients into a large, round machine, which kneaded the batter. "When you dump everything in -- the eggs, flour, and sugar -- you get a mess. Especially when you’re first doing it, you don’t know what you’re doing, so you get even more of a mess. You can tell everybody the first day they work because they look all white, like Casper. It was like an initiation." "We used to sell probably 200 or 300 hot dogs a day," says Asato, who began working at the family business when he was 13 years old. "We would never be able to keep up, so we had to pre-cook back then." Okabe often manned the French fry and waffle hot dog station during his shifts. "It was a hand-burning station," Okabe laughs. The machine made six waffle dogs at a time, and Okabe recalls that on one particular day, he managed to make something like 80 hot dogs in just 45 minutes -- for a Little League baseball team who had dropped by without warning. "We only had 12 in the warmer -- actually maybe 18, because I usually made extra. We just cooked them like crazy. A lot of people would come from all over, just for that -- for the waffle hot dog." Okabe remembers a couple who would stop by every weekend, driving more than 30 miles from Ewa Beach into town for their ritual meal. "She would have a waffle dog, and he’d have a hamburger deluxe -- every Saturday morning," Okabe says. "I don’t know for how long… maybe 20 or 30 years." Over time, the eatery grew to multiple locations, moving the Waikiki location to Kapahulu. A second restaurant opened and closed in Manoa. As the decades wore on, the waffle dog remained, woven into the local fabric, continuing to serve as a popular treat for families for generations. But sadly, the eatery finally closed its doors in 2005, much to the dismay of regulars and die-hard waffle dog fans. 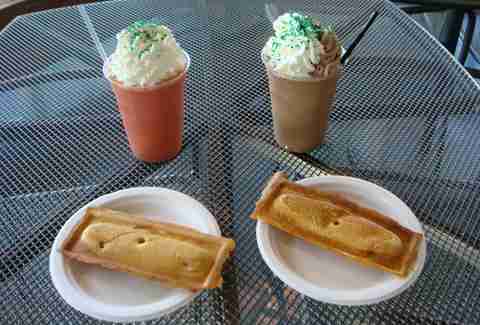 Luckily, the mourning period was short; Asato resurrected the waffle dog only a year later. This process happened almost by accident: he started out just by offering waffle dogs at fundraisers for schools and churches. Asato hadn't exactly been expecting it, but the waffle dog’s popularity unexpectedly took off for a second time. The beginning of the waffle dog renaissance was the Ohana Festival at the Japanese Cultural Center, when word got out that the beloved local treat was back, and suddenly everyone wanted a taste of their childhood again. "We had lines of people waiting," he says. "It was probably an hour to get a waffle dog. I think we sold over 1,000 in one day." At the bon dance, the line for waffle dogs is long, but not impossibly so. Behind a tented table, half a dozen workers scoop batter from buckets into the waffle dog iron mold. A hot dog is added, then more batter, before being pressed into a crispy, compact treat. "It used to take 15 minutes to make a batch, but after years of improvement, cooking time is down to five minutes," Asato says of the fourth generation of waffle dog machines. And true to his word, five minutes later, he lifts a batch from the iron, slices them into single servings, snips away the crusted edges, and presents his hungry clients with perfectly crisp waffle dogs, packed in foil. It's been more than a decade since my last KC waffle dog, and my childhood recollections of consuming them are fuzzy, like an old movie. Before I bite in, I remind myself that odds are, like so many other childhood joys, waffle dogs will probably not be as good as I remember. And yet, after just the first bite, forgotten memories of my grandparents and family birthday parties come washing back, and before I know it, I’m even remembering to consume the waffle dog the same way I did as a kid: dog first, saving the slightly sweet, extra crispy waffle edges for last. Aiea native Tim Unten and I try to remember the jingle, which often played during University of Hawaii games on TV. "Was it ‘What would you do for a waffle hot dog?’" Unten asks, biting into his, as I hum the tune to the old Frank De Lima commercial, sung to the tune of "Drunken Sailor" by the Irish Rovers. I can neither confirm nor deny. The commercial could not be found on YouTube, which means it doesn’t exist in today’s modern world (although this delightful KC throwback commercial does exist, we're pleased to report). As Unten finishes the dog, I ask, "So, what would you do for a waffle hot dog?" "Stand in line," Unten smiles. While summer bon dance season is a great way to get your KC waffle dog fix, the original recipe is also now sold at Hawaii’s Favorite Kitchens, alongside KC’s rightfully popular Ono Ono Shakes, and are also now available at The Medley year-round. Asato, who’s been in the waffle dog game for 40 years, still runs the family business part-time. You can find waffle dogs at fundraising events at schools and churches across the island, where you might also be able to coax Asato into whipping up decadent specialty waffle desserts, made with bananas, chocolate syrup, and whipped cream. "It’s rewarding to give back to the community," Asato says. "For all the years people have supported us, it’s nice that waffle dogs make people happy." As I finish my last bite of the waffle dog, smothered with mustard relish, I’m fueled up and ready. So, what am I gonna do with a waffle hot dog? Take my happy belly for a spin on the bon dance floor, and burn those waffle dog calories, shuffling my two left feet late into the night. Summer Nakaishi is a freelance writer for Thrillist, who hadn’t eaten a KC waffle dog in over 16 years, but is damn happy she finally did.